About five years ago we went to a Native Plant Sale held at Millersville University, Lancaster County, PA. We picked up two native plants, Wild Ginger and Spiderwort, Tradescantia virginiana. Wild ginger is much more plentiful in the wild, at least in the places we’ve looked. The wild ginger we planted has spread out a little bit and the original plant carried its flower from earlier this year until the second week of June. Spiderwort flowers beautifully in the later part of May into June. 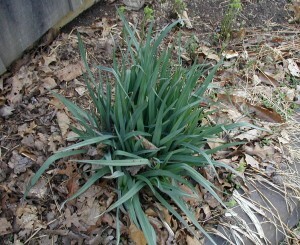 Greenery of the spiderwort plant rises up early starting in April. Photo below taken 11 April 2010. 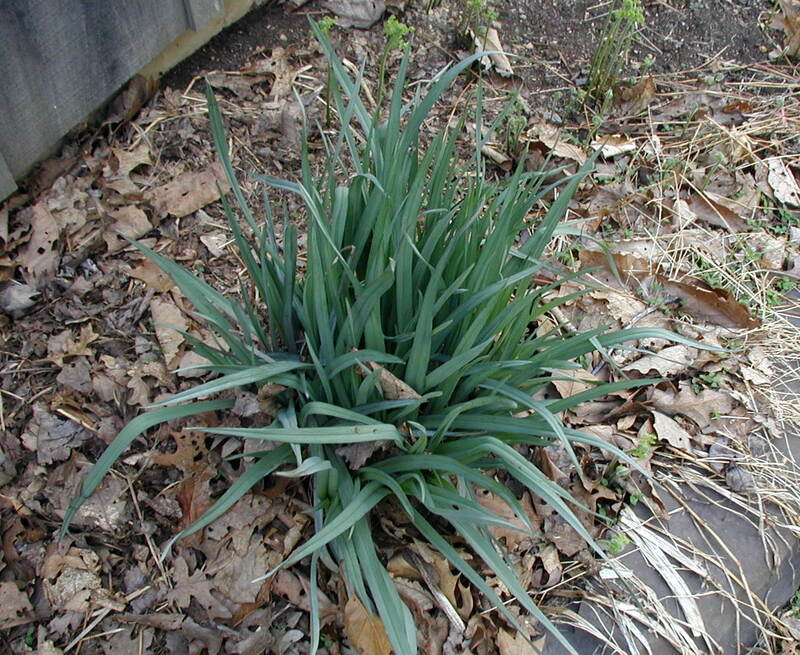 Leaves of spiderwort are already up 8-10 inches. A couple of weeks later (23 April 2010) the foliage is over a foot tall. The linear leaves arch over as they get taller. 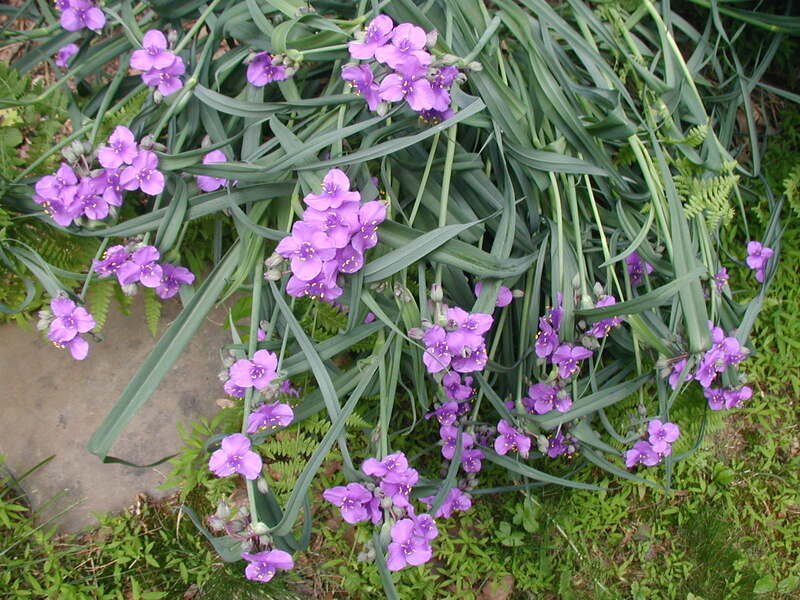 It will take 2-3 weeks from this stage for the spiderwort to start blooming. 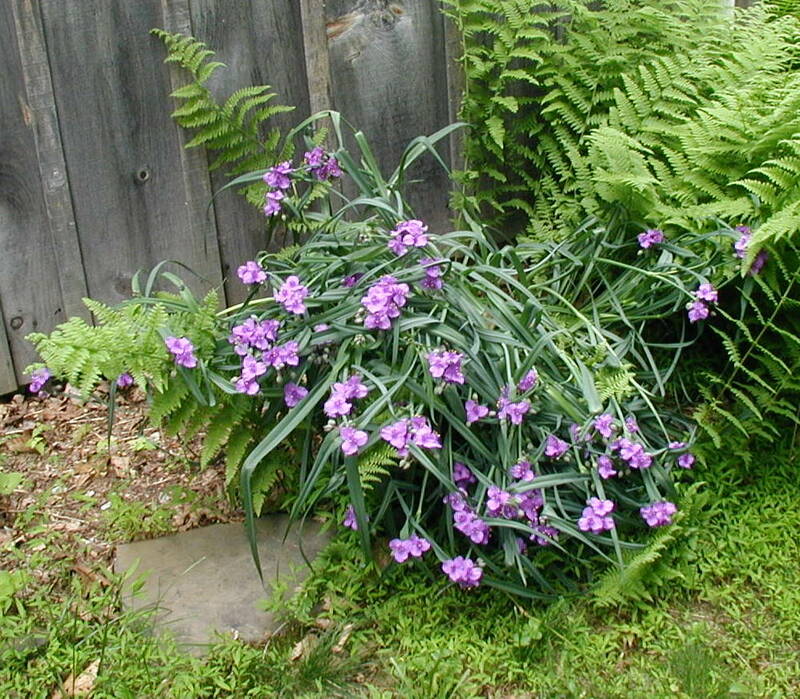 Check out how small this spiderwort plant was in 2006. 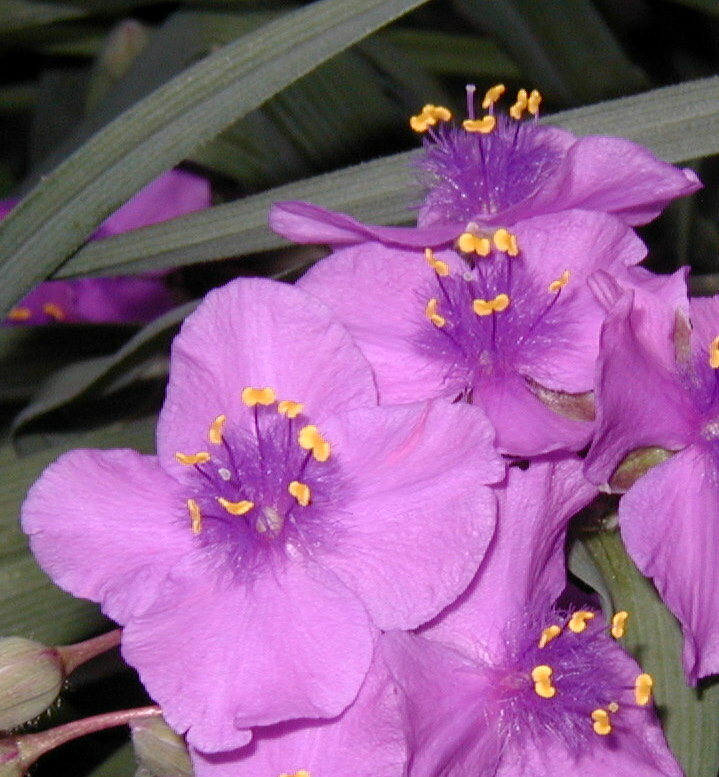 Many purple-blue flowers of spiderwort. 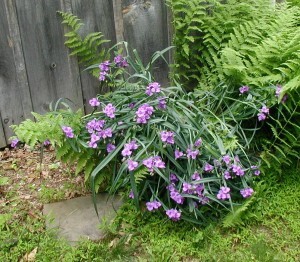 This year I should have staked up the plant as it got heavy with blooms and now is laying over to the side. The flowers are still really pretty! 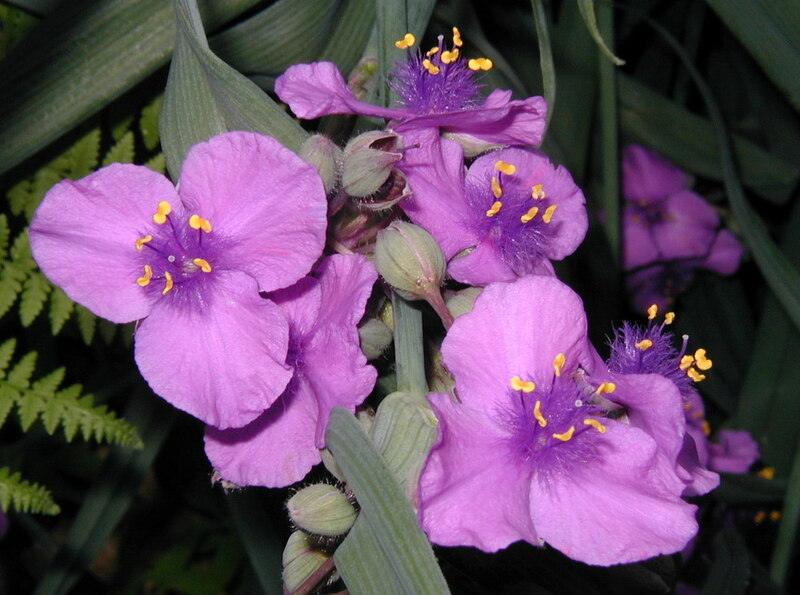 Heavy blooms of spiderwort made the flower stems bow down to the ground. 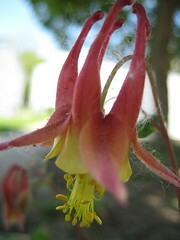 Didn’t get flowering pics until 31 May 2010. 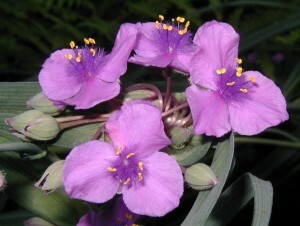 Spiderwort flowers were blooming until 11 June for a 2-3 week blooming period for 2010. Younger plants may have fewer flowers open at one time. 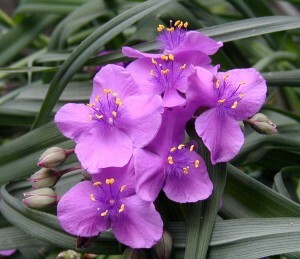 Each bloom lasts for a day and then only in the morning. 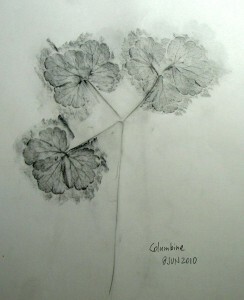 The blossoms wilt and turn to jelly by mid-day. 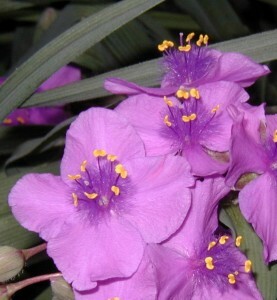 Note the stamens with golden-yellow anthers, fuzzy purple hairs, and the flower pistil with a round end or stigma in center of bloom. Note that the lower left flower has four petals instead of the typical three – only saw one flower with four petals out of about 80 blossoms. Click on any of these photos for a larger view. Purple spiderwort flowers are hairy in the center. 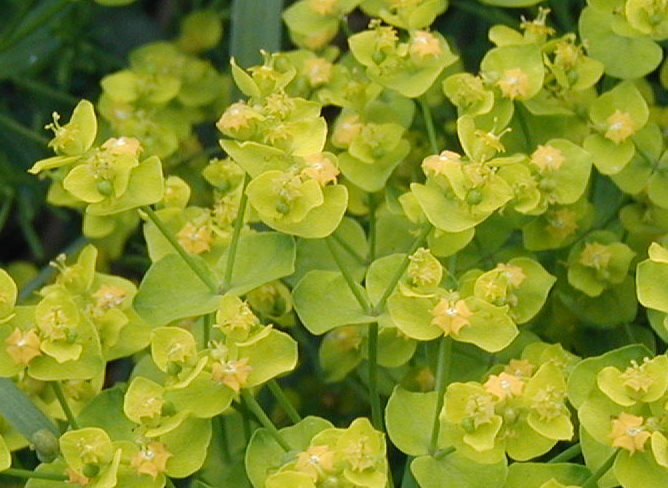 The flowers are so pretty that people used to make them into candy. Peterson’s Edible Plant Guide says all you have to do is rinse the flowers with water, dry gently, brush with egg white and coat with sugar. Not sure the effort would be worth the taste, but at least they’d be real pretty! A few years ago there were only a few ferns on the north side of the house. The ferns are plentiful in the adjacent woods, but there they do not form mats. 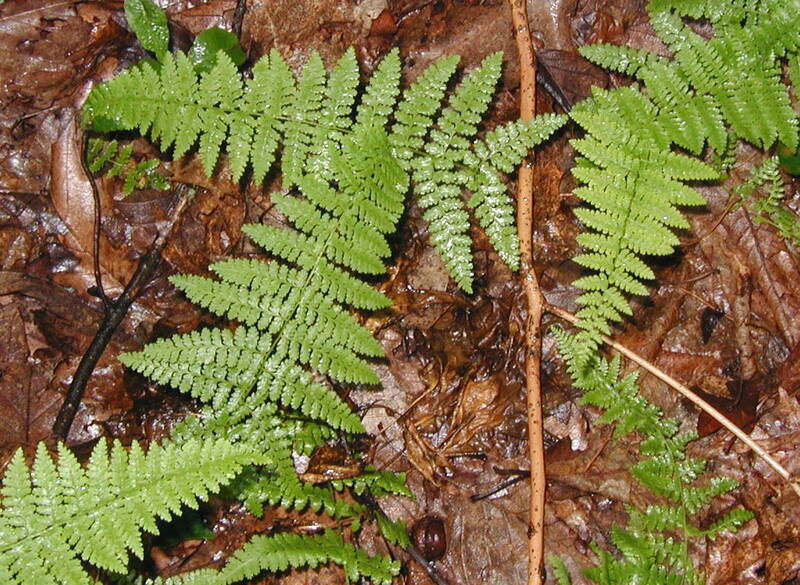 The forest ferns rise up in a ‘singular’ fashion and the fronds are not all bunched up in a large grouping. Hay-scented ferns growing singly in the forest. 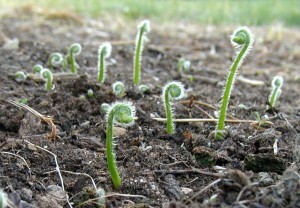 Ferns come up in early April as they slowly unroll their long fronds. 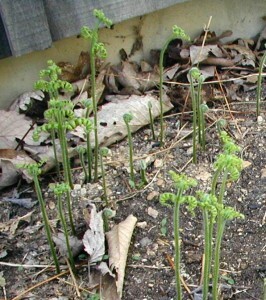 Each frond starts out rolled up in fiddle head fashion. 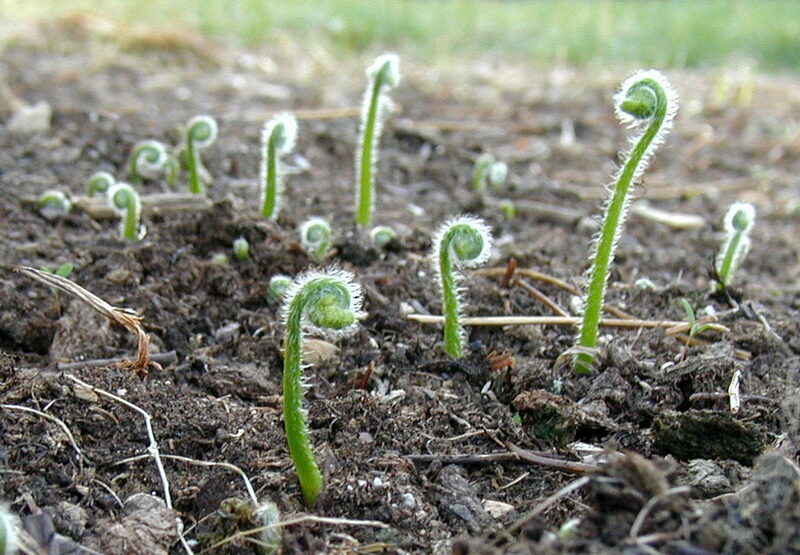 Fiddleheads rise up out of the earth. Photo above taken 11 April 2010. At the back of the garage the ferns numbered a few on the left and the right side was empty. As the years went by the ferns spread out in both directions, further away from the building and further to the right. 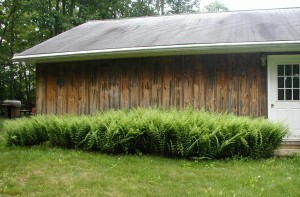 Lush ferns growing on the north side of the garage. 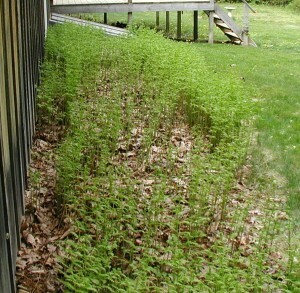 The original patch of fern was a few feet wide and perhaps three feet deep. Seven years later the ferns have taken up the entire width of the garage, about 20 feet wide, and the patch is a good six feet deep. This patch is now thick with fern fronds. 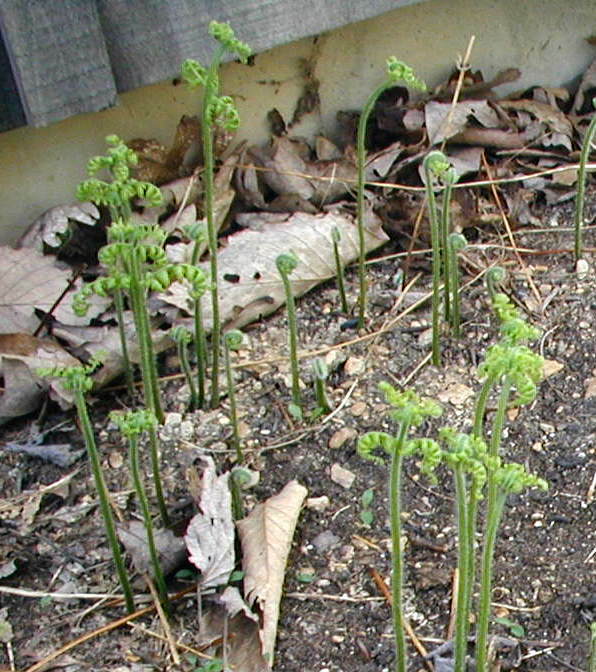 As the ferns came up this Spring the area wasn’t raked of leaves or anything and the ferns sprouted up the thickest we’ve seen them. Ferns on the north side of garage filling in. Photo above taken 2 May 2010. I found it interesting that the ferns that grew the biggest first were the fronds right next to the house and the fronds furthest from the house. This probably signals that the growing ends of the roots are the strongest, and therefore, the first to take advantage of a new growing season. In the woods these ferns are in more of a singular fashion. 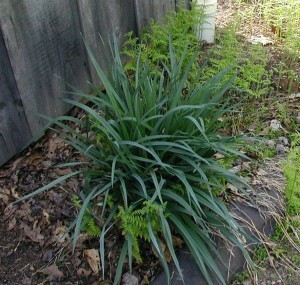 Several fern fronds will be in the same area, but they tend not to occur en masse, at least at this location and time. If left alone the Hay-Scented Fern, Dennstaedtia punctilobula, would probably create a near monoculture like what you see behind the garage. 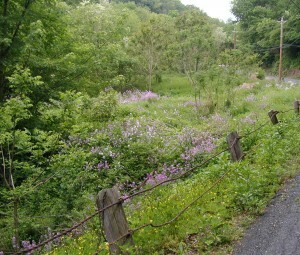 We have a few different kinds of ferns on our land here in South-central PA. The hay-scented fern seems to be the most prolific. We see it in the most places and there are more of them compared to the other ferns. 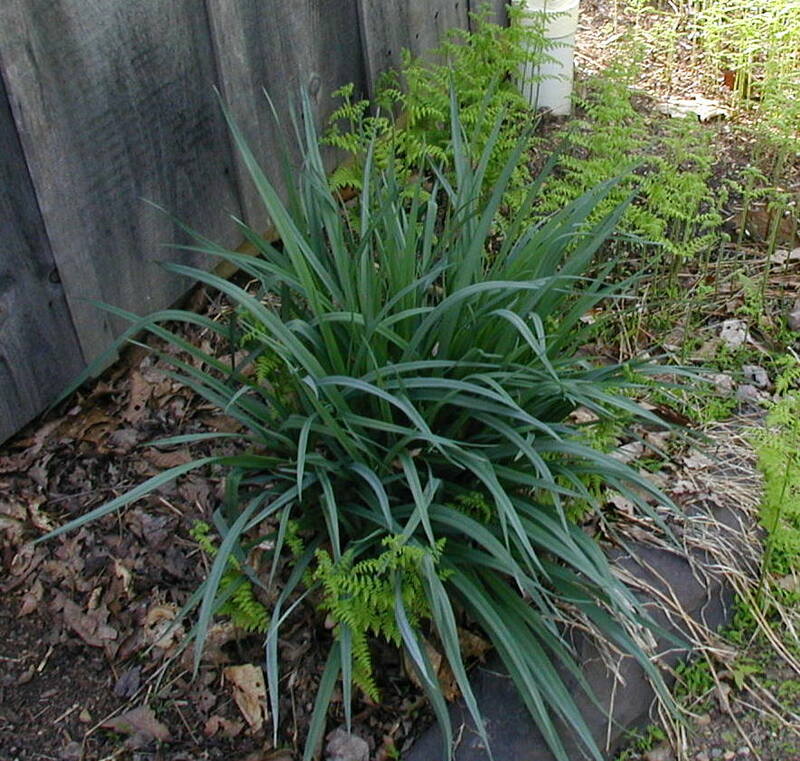 Hay-scented fern, although it is native to North America, can be invasive. 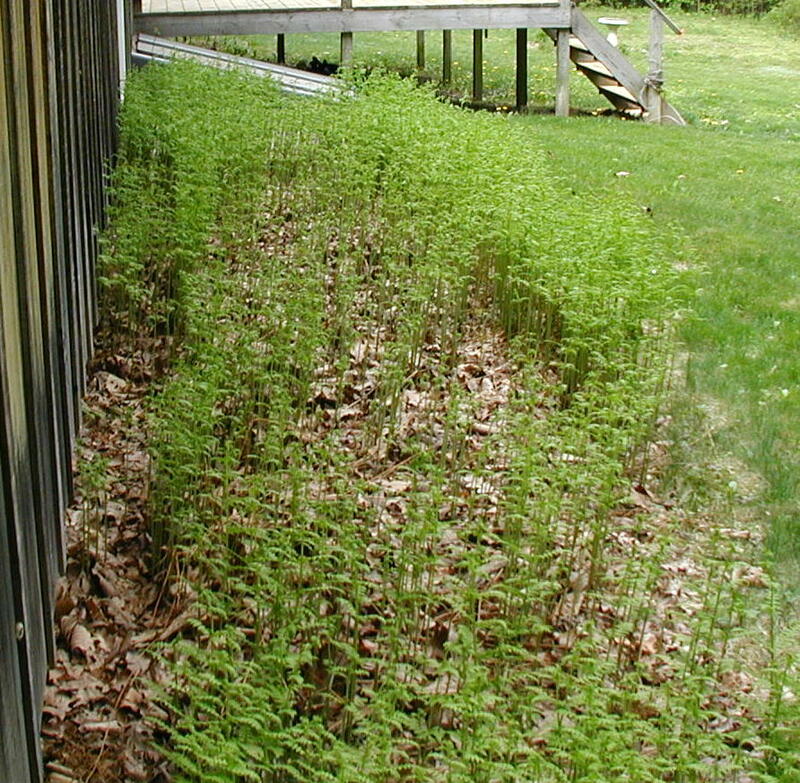 Judging by the thick growth at the back of the house, it’s easy to see that under the right conditions this plant could be a pest. Having said that, I do really like the fact that the ferns are perennial and come up to fill in the length of the garage year after year. 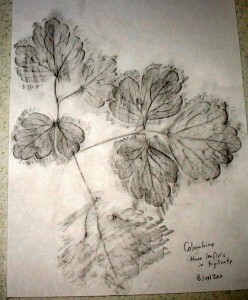 Clover is one of those plants that we all learn about growing up. Even if you are an urban dweller chances are high that you’ve seen clover in a yard, field or park. 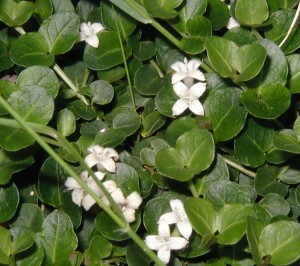 The common white and red clovers are ubiquitous, meaning they occur nearly everywhere in the world. 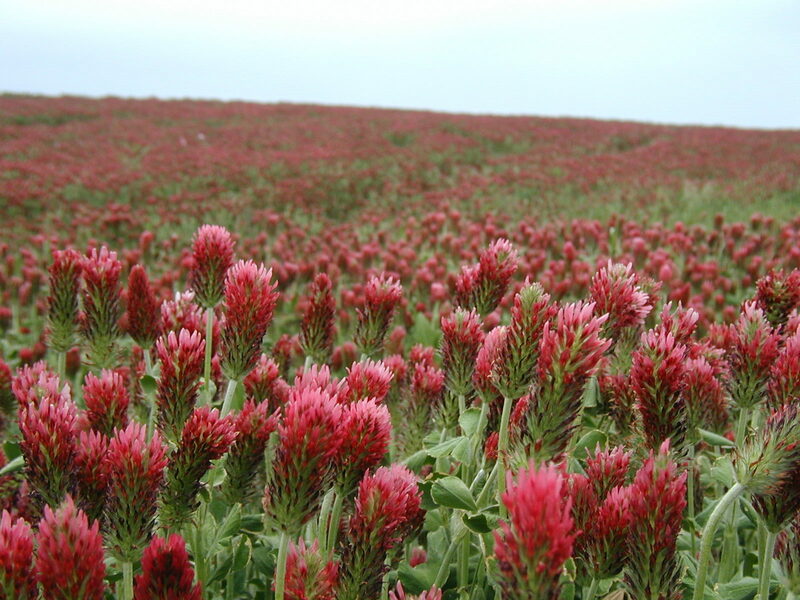 Crimson Clover is native to Europe and introduced in the United States. With over 300 species of clover, there’s bound to be a few in your neighborhood. 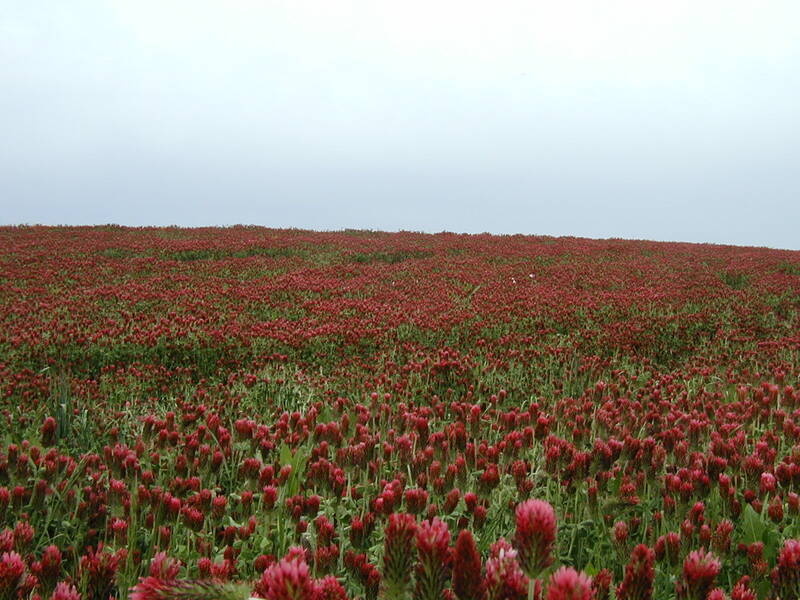 Red clover and white clover have been blooming at the roadsides and in fields and yards around here for at least a few weeks. 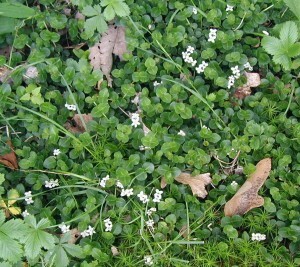 White clover seems to start its flowering before red clover. 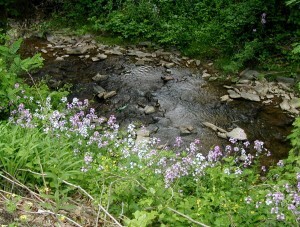 We most often see red clover in fields and by the roadside. Both will sprout again after being mowed, and they’re highly nutritious crops for livestock. 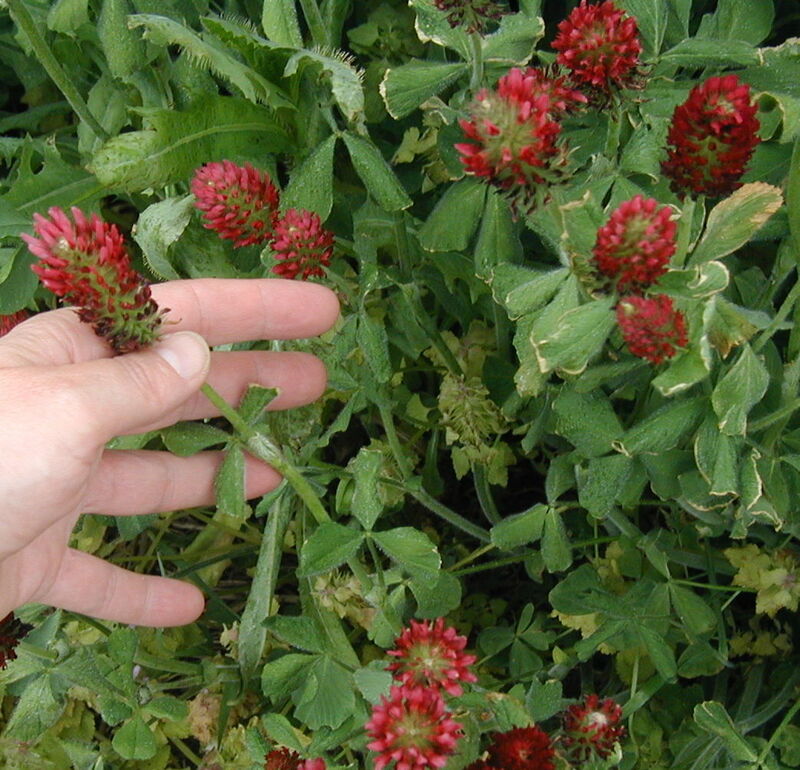 I always wanted to see some Crimson Clover up close. 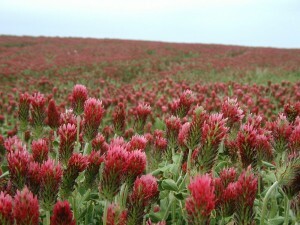 This year I got my wish as a neighboring farmer planted a whole field of it! 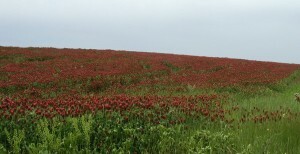 Field full of Crimson Clover. 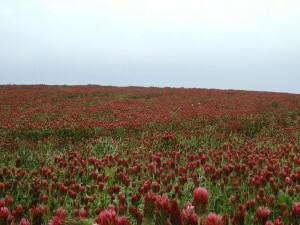 The crimson clover field was harvested the week after these photos were taken on 17 May 2010. 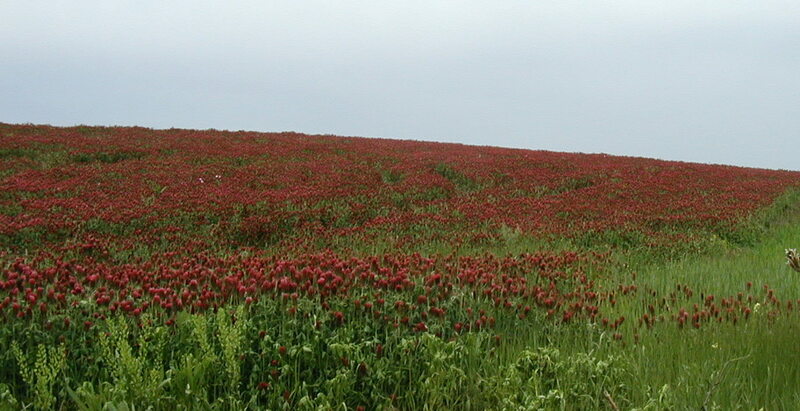 Crimson clover as far as the eye can see. Crimson clover, Trifolium incarnatum, attains a height of 15-20 inches with a 1-3 inch long crimson head of flowers. Like all clovers the leaves occur in threes and are referred to as trifoliate. 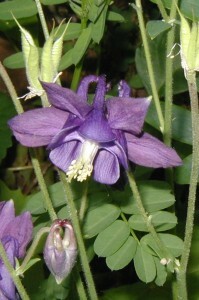 Note the genus name, Trifolium. Trifoliate leaves and red heads of crimson clover. Crimson and clover, over and over! clover, there’s bound to be a few in your neighborhood. 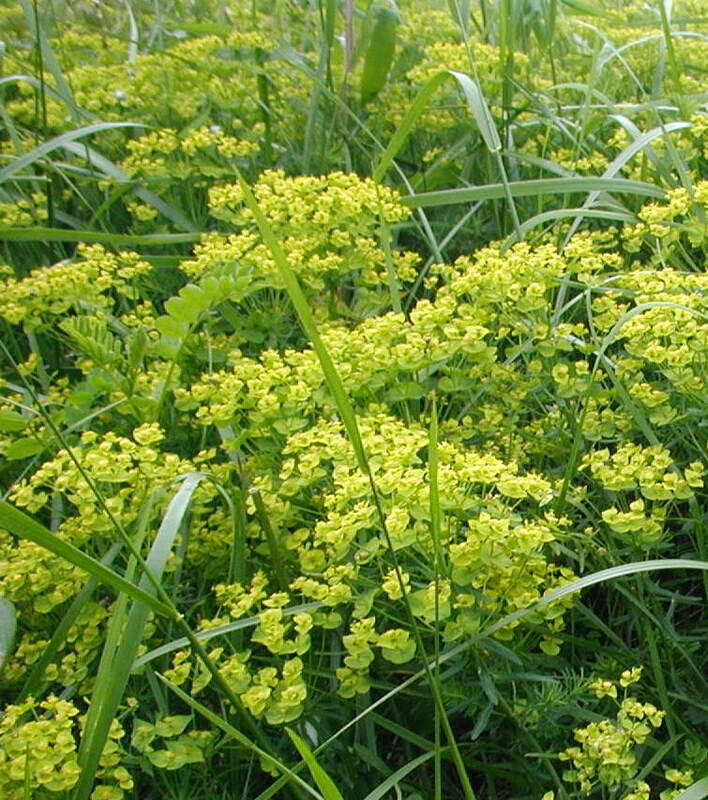 they’re highly nutritious crops for livestock. wish as a neighboring farmer planted a whole field of it! 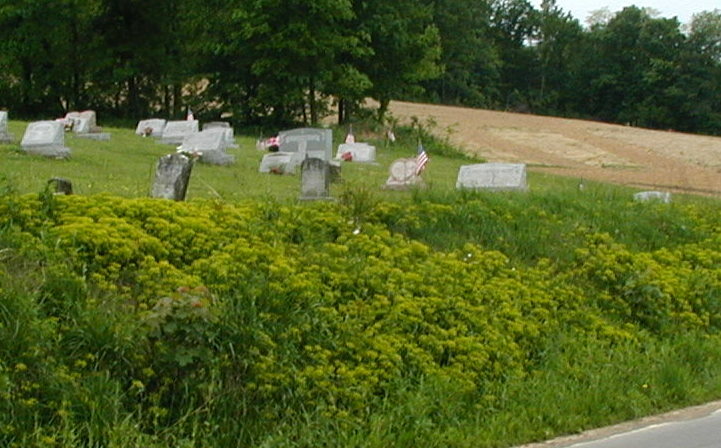 taken on 17 May 2010. 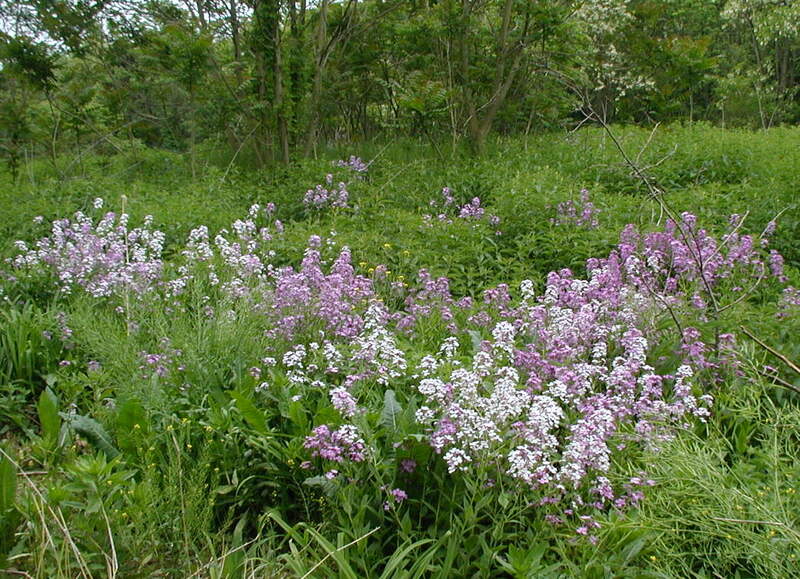 May’s beautiful colors were highlighted in the country by the large swaths of pink, lilac, purple, and white flowering Dame’s Rocket, a.k.a. 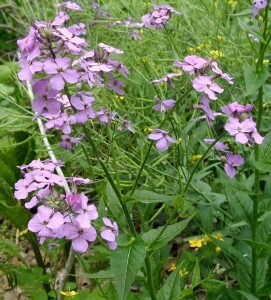 Dame’s Violet, Hesperis matronalis. 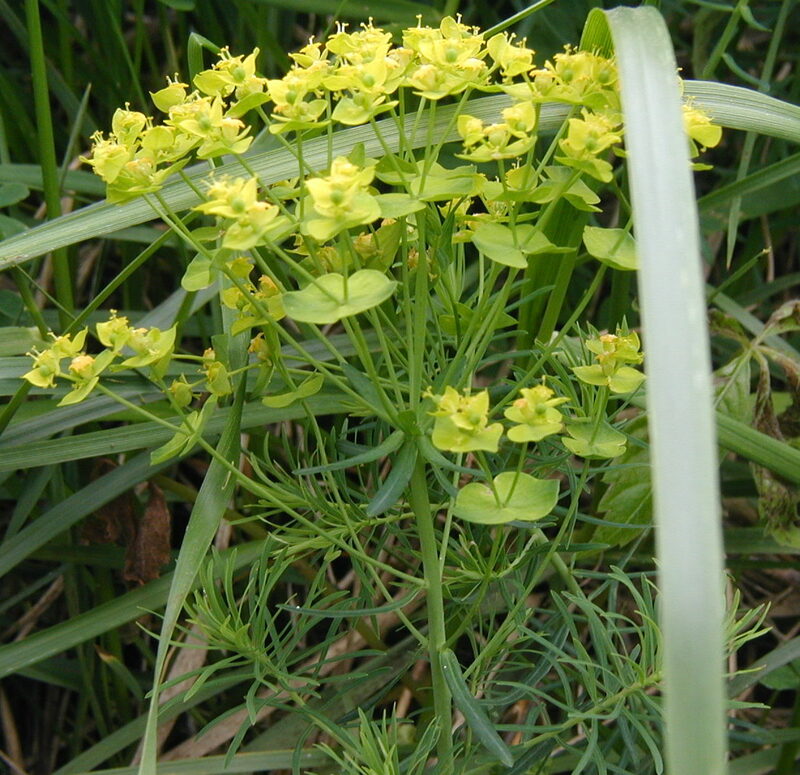 Four-petal flowers cluster in terminal spikes at the top of three feet tall stems. 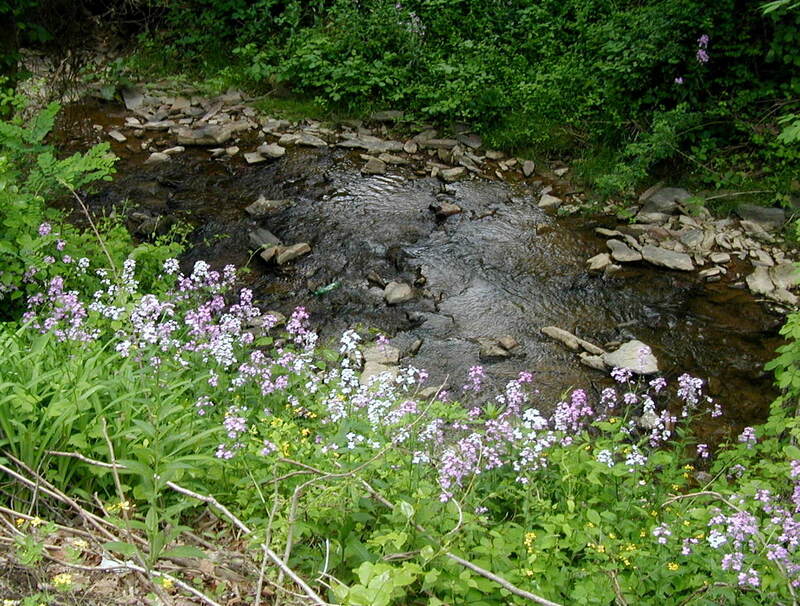 For a two or three-week period in May Dame’s Rocket will be blooming in South-central Pennsylvania. Great patches of purple and pink colors from Dame's Rocket flowers. 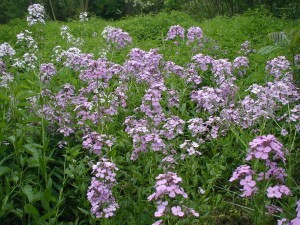 Dame's Rocket blooming in waste area between two roads. 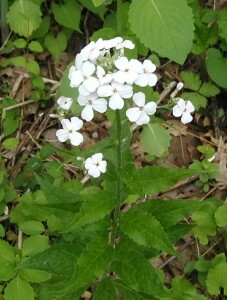 Dame's Rocket on slope above drainage culvert. Flowering above a culvert with celandine. 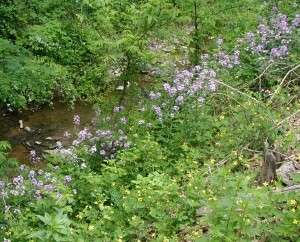 Dame's Rocket flowering at the edge of woods with locust trees in bloom. 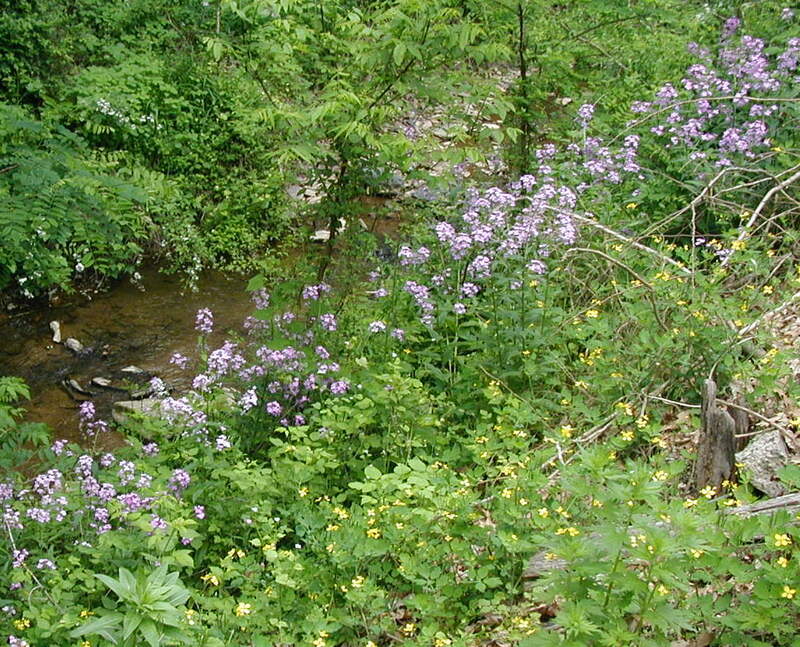 Group of purple flowering Dame's Rocket. Spreading purple clusters of Dame's Rocket. 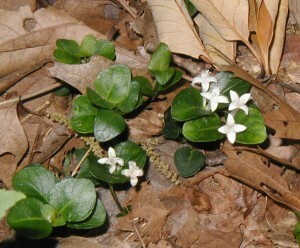 Flowering stalk with alternating leaves and four petal flowers. 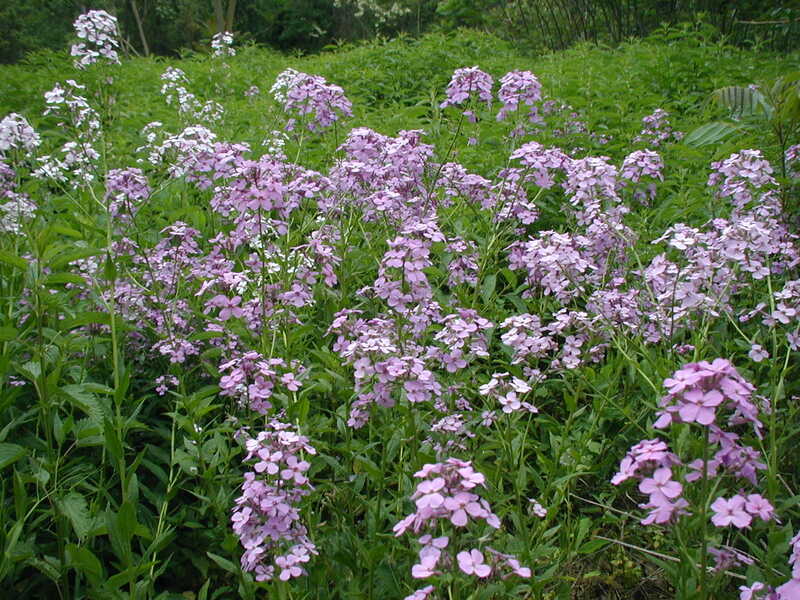 Dame’s Rocket seems to prefer shady areas near the tree line or at the edge of the trees where the forest meets the road. The ones photographed above were growing in a waste area in between a two lane road and a highway access road. 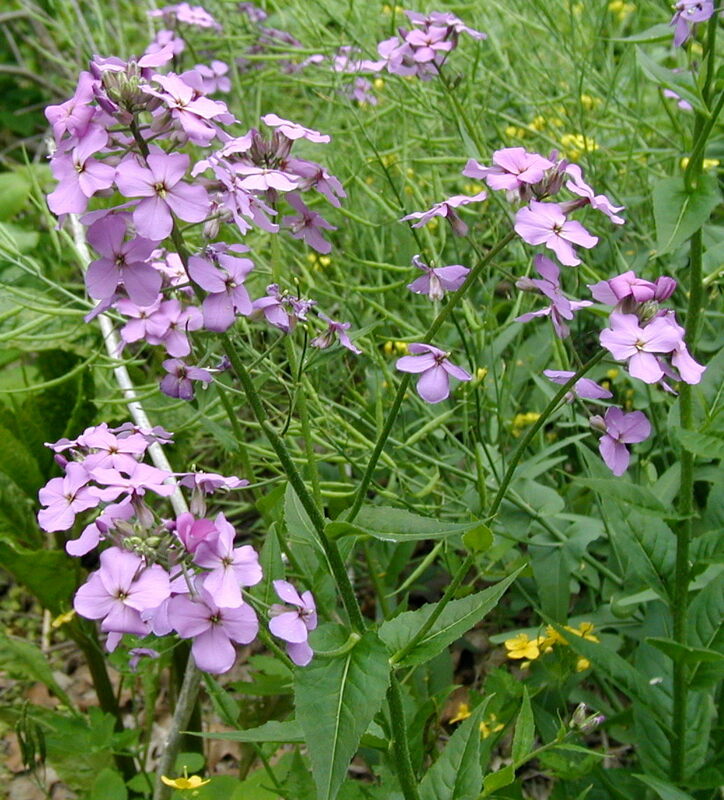 Native to Europe and Asia, Dame’s Rocket was brought to America hundreds of years ago for its beautiful flowers. 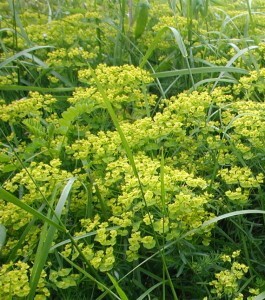 It has since escaped gardens to become naturalized in the Eastern U.S. where it is often seen in fields and near roads. 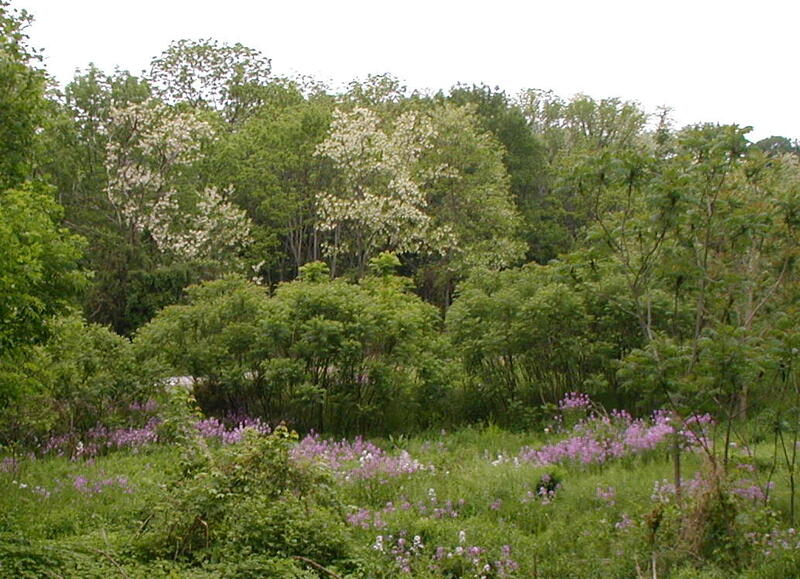 It has been so successful that three states consider it invasive. 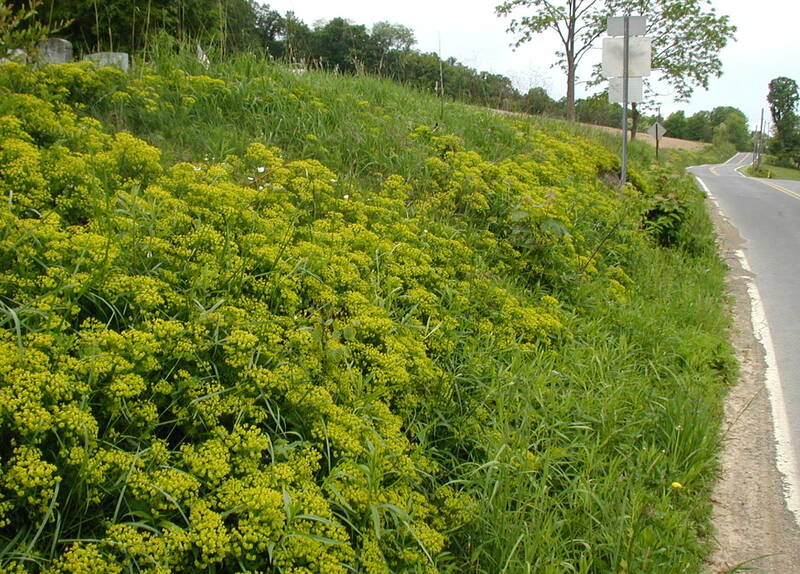 Colorado has it on its B list of noxious weeds, Connecticut has banned it, and Massachusetts has prohibited it. As of yesterday there are 10 fewer Japanese Beetles in this world. I really don’t like killing living things, but these little buggers just had to go. How dare they munch on the cherry leaves, flowers of Echinacea and basil leaves that we want for our own? How did they meet their end? Soapy water did the trick! No spraying of pesticides needed. Just take a small bucket, add a drop of liquid soap and a little water. Tap the buggers into the drink and they won’t be contributing to the next generation of beetle pests. A plastic milk or water jug makes a great soapy water bug catcher. Cut away the top and front half of the jug leaving the handle intact and about half of the jug that will contain the soapy water. Every day for the next couple weeks we’ll walk around the gardens removing these beetle pests. We don’t worry that we’ll decimate the beetle population or make them go extinct, because we see plenty of the beetles on tree leaves in the adjacent forest. However, we may have fewer beetles laying their eggs in the lawn that would make up next year’s grubs.